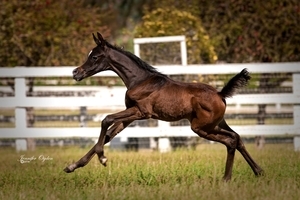 During the first week in June there is a wonderful gathering of straight Egyptian Arabian breeders that takes place in Lexington Kentucky at the Kentucky Horse Park. These breeders come together to celebrate and showcase their horses plus enjoy the company of other like minded individuals. In addition they have the opportunity during this week to learn more about the legacy, history and traditions that surrounds this amazing horse as well as market the horses. People come from all over the world; representatives from the Mideast, Australia, Europe, Egypt and Morocco attend and contribute to the excitement of this show. Whether or not it is a beautifully tooled saddle that King Mohamed VI of Morocco has donated as a prize or Al Shaqab a member of the Qatar Foundation sponsoring a Guest Speakers event such as Princess Alia Hussein of Jordan and Peter Upton (artist from the U.K.) sharing about the new book they have co-authored on the horses of the Royal Stud of Jordan and their history. Marion Richmond of the famous Simeon Stud also was a featured speaker on the history of her farm in Australia. 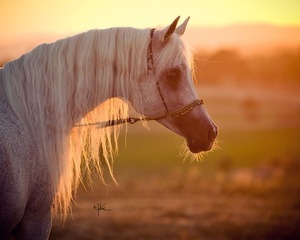 Over 325 horses participate in this four day show; professionals and amateurs display the horses in a kind and gentle manner either ridden or in hand. Besides the seminars that target both adults and youth there is the Khan El Khalili Bazaar filled with donated items that are auctioned silently with the top bidding ones moving on to a live auction during the Friday night Gala. The dinner dance Gala this year featured a Venetian theme. It was obviously embraced as evidenced by the many authentic masks seen that evening. As one entered the ball room tables were decorated with feathery palm trees and lights reflecting off watery looking center pieces, with graceful stilt walkers’ entertaining guests while they seemed to float around the room. The live art auction featured unique items other than art such as a trip sponsored by a breeder in the Kingdom of Saudi Arabia to visit his farm and this sold quite well. The Pyramid Society Trustees awarded a very surprised Anna Bishop the Trustees Award via a “Karnack the Great” skit put on by Trustees President Howell Wallace and Pat Moseley. This special award is given to a person who has donated countless hours and time for the benefit of the straight Egyptian Arabian horse; no one is more deserving than Anna Bishop, Director of the Pyramid Society. At the Pyramid Society booth in the covered arena, Anna Bishop along with her very capable Staff made sure that all books and clothing with the PS logo were tempting to buyers as they strolled to their seating. To insure that you came to the booth it was strategically placed across from the hospitality cart where you could have your first cup of morning coffee, eat a roll and then during the day partake of lemonade, iced tea and popcorn. Vendors came from all over the USA and even Egypt to display their wares, from tack, jewelry, clothing and art of any medium including paintings to sculpture. The arena featured farm flags and these flags of the many countries represented made a festive backdrop for showing the horses. The judges were from Saudi, Italy and the United States. A European format for judging was utilized with a point category scoring system that awards the horses for their good qualities. The Egyptian Breeders Challenge Auction once again exceeded expectations in sales of stallion services and everyone had a great time bidding and afterwards celebrated this success by line dancing and a good old fashioned barbeque right on the floor of the area. Awarded to the winner of the Straight Egyptian Futurity Colts of 2009, and in memory of Vincent Fortuna’s son, Thomas; commissioned by Barbara Griffith and Barbara Vallee. 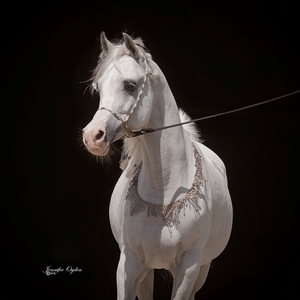 Jasoor’s dam, Jade Lotus SMF was the 2009 Supreme Reserve Champion mare at the Egyptian Event and his sire, *Simeon Shai+ is a quadruple crown winner of the US, Canadian Nationals, Scottsdale and Salon De Cheval shows. Henry and Christie wish to congratulate the owners of the *Simeon Shai+, BB Thee Renegade and Majestic Noble SMF progeny and grandget shown at the Egyptian Event.